Internal Family Systems (IFS)stems from the idea that individuals cannot be fully understood in isolation from the family unit—to develop techniques and strategies to effectively address issues within a person’s internal community or family. This evidence-based approach assumes each individual possesses a variety of sub-personalities, or “parts,” and attempts to get to know each of these parts better to achieve healing. 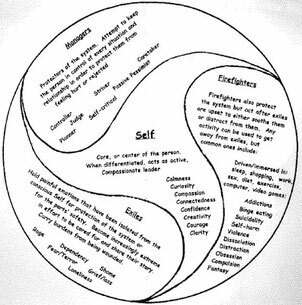 By learning how different parts function as a system and how the overall system reacts to other systems and other people, people in therapy can often, with the help of a trained mental health professional, become better able to identify the roots of conflict, manage any complications arising, and achieve greater well-being. Parts engaging in non-extreme behavior are beneficial to the individual. There is no such thing as a “bad part.” Therapy aims to help parts discover their non-extreme roles.